Through the first SlOkam, the greatness of nAthamunigaL‘s knowledge etc relating to bhagavAn‘s parathvam (supremacy) was explained. In this SlOkam, the ultimate greatness of nAthamunigaL’s knowledge etc relating to bhagavAn’s avathArams is explained. Alternatively, it is explained “his knowledge etc (explained in previous SlOkam) instead of being curtailed in him, is flooding down to me (ALavandhAr)”. My salutations to SrIman nAthamunigaL whose divine feet are always my refuge in this world and the other world as well, who is the pinnacle of greatness of true knowledge and devotion at the divine lotus feet of emperumAn, who killed madhu, and one who is [my] lord. thasmai nama: – ALavandhAr is saying “I am his servant, again and again” as said in SrIvishNu purANam 1.19.79 “namasthasmai namasthasmai” (prahlAdha says – I salute the great personality, I salute him) and in SrI bhagavath gIthA 11.39 “namO namasthE’sthu sahasrakruthva:” (I salute you thousand times). madhujith – As he appeared as anirudhdha and destroyed [demon named] madhu, the first weed, it is saying that he will eliminate the hurdles to reach bhagavAn. angri – [attachment towards the “divine feet”] Explaining that periya mudhaliyAr is captivated by such quality of bhagavAn as said in SrI rAmAyaNam sundhara kANdam kishkinthA kANdam 4.12 “guNair dhAsyamupAgatha:” (lakshmaNa – I am surrendered to SrI rAma’s qualities), and his ananyArha SEshathvam (exclusive servitorship towards bhagavAn). sarOja – The enjoyability which cannot be given up, even if the [eternal] sambandham is not recognized, is explained. Lotus flower is a false comparison when it comes to the blossomed state, freshness, coolness, fragrance etc., [of the divine feet of bhagavAn]. thathva gyAna – true knowledge means knowing about his avathArams (incarnations) and ASritha pArathanthriyam (his subservience towards his devotees). He himself mercifully said in SrI bhagavath gIthA 4.9 “janma karma cha mE dhivyam Evam yO vEththi thathvatha: | thyakthvA dhEham punar janma nithi mAmEthi sO’rjuna ||” (Oh arjuna! One who realises my divine birth and my divine activities truly, he does not take birth again [in this material realm]; he reaches me). purusha sUktham “thasya dhIrA: parijAnanthi yOnim” (Only the wise know his incarnations); SrI rAma also mercifuly said in SrI rAmAyaNam yudhdha kANdam 19.21 “ahathvA rAvaNam sankyE …” (I will not enter ayOdhyA without destroying rAvaNa along with his clan in the battle. I take this vow on my brothers) and SrI rAmAyaNam ayOdhyA kANdam 97.8 “yadhvinA bharatham thvAm cha SathrugnanchApi mAnadha | bhavEnmama sukham kinchith bhasmasAth kuruthAm SikI” (Oh one who brings glories [lakshmaNa]! If there is any joy for me in the absence of bharatha, yourself and Sathrugna, let that joy be burnt into ashes). SrI rAmAyaNam AraNya kANdam 10.19 “apyaham jIvitham jahyAm …” (SrI rAma tells sIthA – I may abandon my own life, yourself along with lakshmaNa, but will never abandon my vow. Specifically, I will never abandon the vow given for brAhmaNas). SrI rAmAyaNam AraNya kaNdam 111.7 “AthmAnam nAthivarthEthA: …” (vaSishta says – Oh rAghava! By accepting bharatha’s request, you will remain without abandoning your nature of being subservient to your devotees). anurAga – anurAga means unsatiated love without enjoying these aspects. mahimAthiSayAntha sImnE – One who is the pinnacle of such great knowledge and love for bhagavAn. mahimA – mahathva (greatness). As explained in thaiththirIya upanishath “thE yE Satham” (100 times of such bliss), starting with the bliss of a human and reaching upto the bliss of ISwara, nAthmunigaL’s love towards bhagavAn has no limits. nAtha munayE – He is glorified as “Oh the lord of this dharSanam (school of philosophy)” by those who remain as said in thiruvAimozhi 2.7.6 “madhusUdhanai anRi maRRilEn” (we exist only for madhusUdhanan). One who has the thathva (knowledge) and hitham (means) firmly in his heart. “thasmai nama:” (I salute such nAthmunigaL). athra parathra chApi – In this material realm and in paramapdham, the destination. nithyam – nithyam is also explained as daily, as in nithya agnihOthram, which implies agnihOthram is performed at certain times of the day. Here nithyam means “always”. yadhIya charaNau – the divine feet which transformed me into my current state [of knowledge, devotion etc]. SaraNam – both upAyam (means) and upEyam (goal). 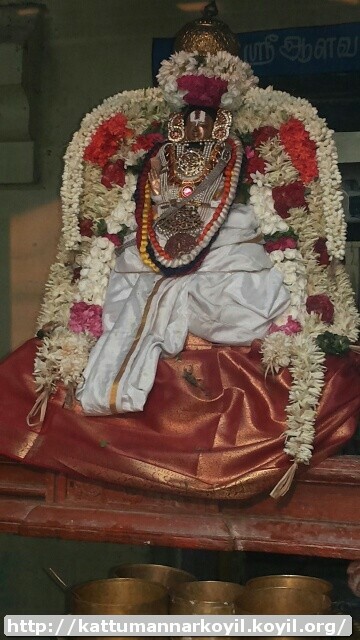 madhIyam – periya mudhaliyAr‘s divine feet are both upAyam and upEyam for me. That is, since he instructed that bhagavAn is the upAyam when I was in the worldly state, since he mercifully nurtured devotion towards bhagavAn which instills firm faith, since he will make me enter the assembly of nithyasUris after reaching paramapadham, and since his being the goal like the nithyasUris, he himself is considered as my goal. This entry was posted in Other, sthOthra rathnam on December 15, 2016 by Sarathy Thothathri.